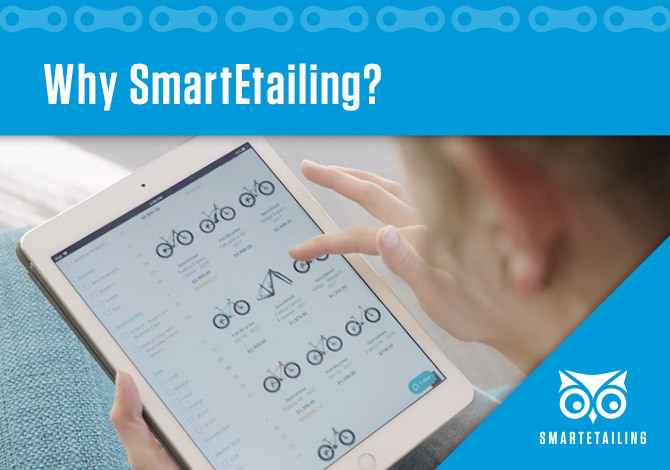 If you're like most bike shops, trying to tackle the everyday demands of running a business while keeping up with the latest online trends can be daunting. Managing the sales floor and service department pulls a majority of your attention, while your online presence collects dust in the corner. As the way consumers shop changes, catching up to meet their demands can be a frustrating proposition. That's why we have developed a turnkey web solution that allows you to create a website that mirrors your physical store. Show the items you have in stock, deliver products in a way that's comfortable for you, and allow your customers to shop your store any way they choose. All with a web service purpose-built for independent bicycle retailers. Think about the last time you shopped online. What did you do? If you're on Target, REI, or Home Depot's website, you went into the catalog. You found the product you were interested in. You saw where's it at, when can I get it, and at what price. We want to bring that functionality to your business. In fact, 90% of retail today in the US is done in store but 80% of those customers pass through your website before they come in. You need to offer your customers 24/7 access to your business to make shopping with you easy. Your customers are busy they fit in shopping when and where they can and more often than not it's on a phone or a tablet. The days of your customers popping into your bike shop on their way home from work, doing a "hot lap" to see whether you have what they need. They're gone. Today they want to pull out their phone and see what you have before they go out of their way if you can't give them that they're gonna go online and they're gonna find somebody who will and they just assume have it shipped to their house versus coming in and shopping with your store. First, we keep your virtual shelves stocked. We have relationships with over 400 brands and have tens of thousands of products pre-built into our library. That means you can get your inventory online without having to invest your payroll dollars. Second, we provide the shopping experience that consumers want. They want to see what you have in stock and at what price. More and more they want to buy online. In fact, across our entire network we've seen a 30% increase in online sales each of the last two years. Significantly outpacing the rest of the bike market. Buying online for in-store pickup is increasingly popular. Consumers like the convenience and cost savings of in-store pickup. I see that as a big growth opportunity for your business. Lastly, we make it easy. All we do is work is work with bike shops. We understand you and your business so we can walk you through every step of the process and you can focus on running your store. It's easy to get a free demo on our website. Let us show you how we can change your business.